Lovely quiet location. Sophie collected us from the ferry port and it was just a three minute drive. 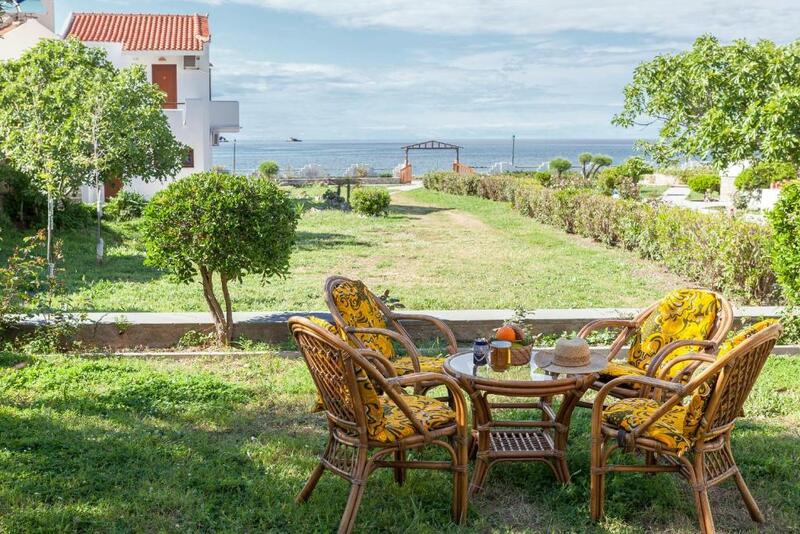 Spotlessly clean and lovely large apartment with a sea view and large balcony. The apartment was very well equipped for cooking. The pool was a walk through the gardens to the top end of the property, it too was very clean and well equipped even had a fridge which could be used to chill your drinks and glasses. Comfortable sun beds with cushions and lots of parasols available. The view from the pool area is exceptional. The town was about a seven minute walk but this meant that it was very quiet in the nights as the town could be a bit noisy. The location is great - 10 minute walk into town, so it's close it everything but it's quiet and private. We also appreciated a room upgrade that Sophie kindly offered. The sea views are gorgeous. Beautiful garden, pool and big apartment. Sophie is Very Kind and helpful. Quiet, well kept gardens & pool areas. Cleaning staff friendly & helpful. Pool area has great views. Accommodation had a lovely private area with seating, table, chairs etc. Good A.C.
Sophie was an amazing host and made sure we had a pleasant stay. She was very friendly and easy to contact. That made our holiday there even better. The quiet place and the beautiful garden around, the pool, Sophie who was very helpful. Location. Pool. View. Gardens. Sophie was extremely helpful with sorting out ferries and giving us a lift to and fro. Great place! Good location. Sophie took good care of us. 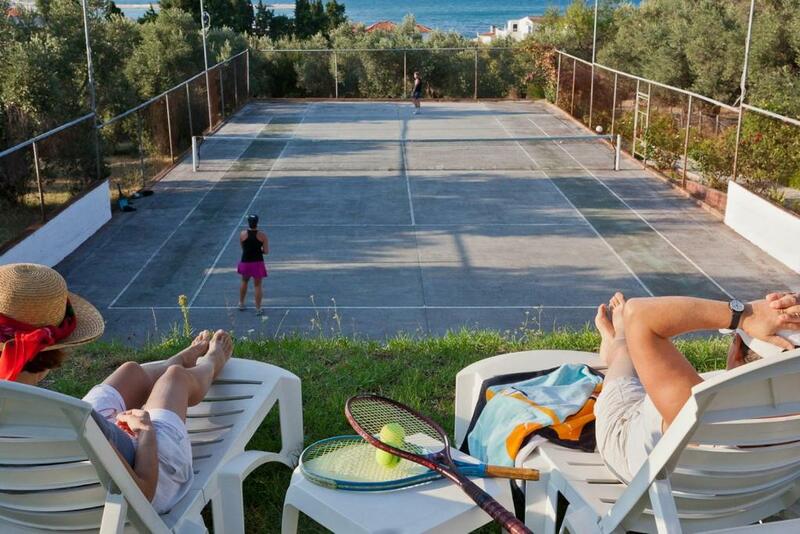 Lock in a great price for Takis - Sophie Studios & Apartments – rated 9.1 by recent guests! 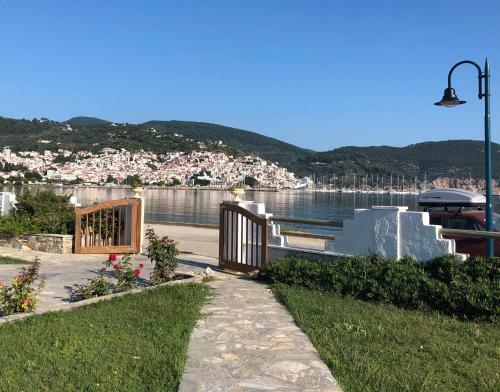 Just 2,300 feet from Skopelos Town along a coastal road, this beachfront hotel features a pool and a tennis court in a tranquil olive grove. 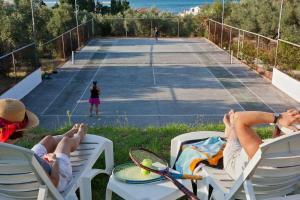 Units offer free Wi-Fi and balconies overlooking the Aegean Sea or Mt Palouki. All air-conditioned units at Takis - Sophie Studios & Apartments include a kitchenette with a fridge, cooking rings and electric kettle. Every studio or apartment has a dining area and the balconies are equipped with a table and chairs. There are plenty of sun loungers around the pool, while an outdoor dining area with a traditionally built BBQ is also available for those wishing to enjoy al fresco meals. 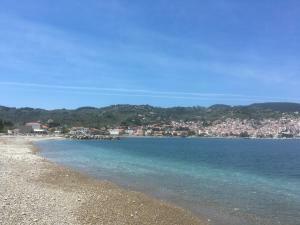 The hotel offers free transfer from Skopelos Port and the staff can arrange car and boat rental. Staff can also arrange yoga classes. A pedal canoe is available for guests. The lively town of Skopelos has jazz bars, fish taverns and souvenir shops. The famous Stafylos Beach is 2.5 mi away. Free private parking is possible on site. When would you like to stay at Takis - Sophie Studios & Apartments? Air-conditioned studio with a balcony enjoying a sea or mountain view, and a well-equipped kitchenette. My late husband Takis and I, Sophie, were born in Alexandria Egypt. We came here for our honeymoon and Takis shared my enchantment of the island. We decided to make Skopelos our permanent home in 1991. House Rules Takis - Sophie Studios & Apartments takes special requests – add in the next step! Debit card Takis - Sophie Studios &amp; Apartments accepts these cards and reserves the right to temporarily hold an amount prior to arrival. Takis - Sophie Studios & Apartments accepts these cards and reserves the right to temporarily hold an amount prior to arrival. Please inform Takis - Sophie Studios & Apartments of your expected arrival time in advance. You can use the Special Requests box when booking, or contact the property directly using the contact details in your confirmation. The closest beach is not worth it, but a short ride away there are several magnificent beaches. (Later in the autumn friends had a problem with mosquitos and humid sheets but We had nothing of that kind) The bathroom was rather small but that was no problem to us. We found this a small paradise, with it’s big secret garden, swimmingpool and seawiews. It is placed a short walk from the Town near the sea and is very calm. 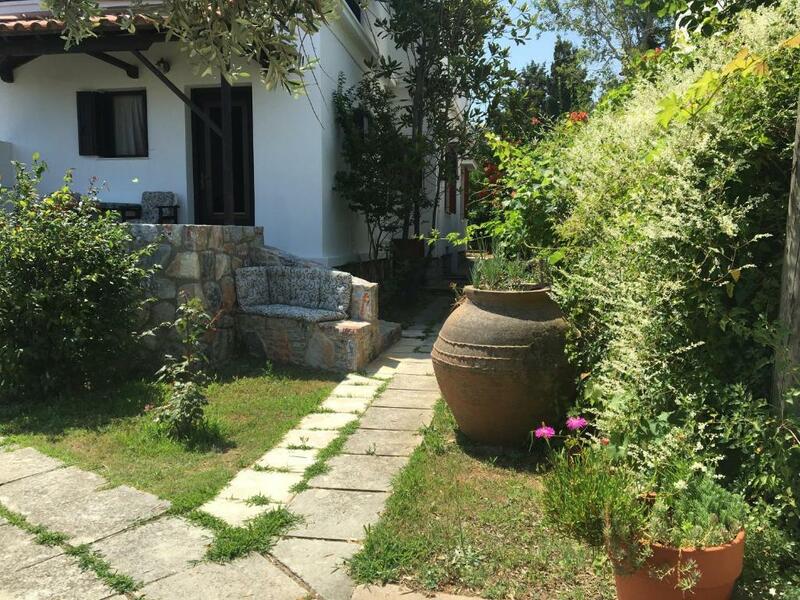 It is not so modern but well kept and the beds were the best I have had in Greece. Small details like information about exkursions, a kitchen towel and a well equiped kitchen was nice. Sophie picked us up at the bus station and also took us to the Ferry when we were leaving. Not enough light in kitchen & bathroom areas,some listed amenities not there (toaster etc). VERY hard bed. Could do with an upgrade. the beach and the sea in front of the property is not nice but the view is still fantastic. Only negatives were the hand held shower in the bathroom - not ideal and the WiFi was intermittent. Where to start, everything was excellent. Thank you Sophie. 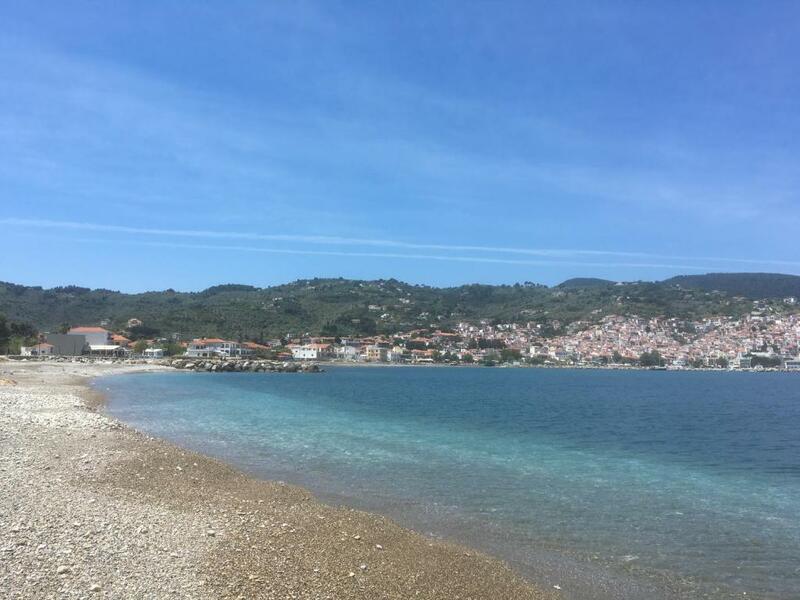 We caught the ferry to Glossa and the bus to Skopelos town where we were met by Sophie who drove us to Takis Sophie on the sea front pointing out landmarks including the closest Supermarket. Our apartment (7) on the ground floor at the back was spacious and cool with a fabulous area outside to sit and eat. Established gardens with vibrant flowers including fruit trees and a vegetable patch. Chicken coop with two cockerels vying over the hens and a large swimming pool. My husband borrowed a bike and explored the island whereas I used public transport - fabulous :) On our last day Sophie took us to Skopelos port in time to catch the ferry back to Skiathos, hoping to see the Mamma Mia chapel from the sea, which due to the angle of the boat we didn't, however we were lucky enough to see dolphins. Nothing....WiFi a bit iffy at times. Great quite location 10 minutes walk to the centre of town. comfortable rooms with sea vies. The pool area (although a short walk up hill behind the accomodation) has fabulous views over the harbour and is a quite and relaxing area. Sophie is lovely and always on hand if you need anything. (Our kettle broke and was replaced in minute's) Sophie picked us up and dropped us back at the ferry. Overall a fabulous accomodation. Having a car made the village and restaurants more accessible although there are bikes to ride and if you are very active and enjoy walking it is an easy stroll into town. A quiet, restful place to stay. 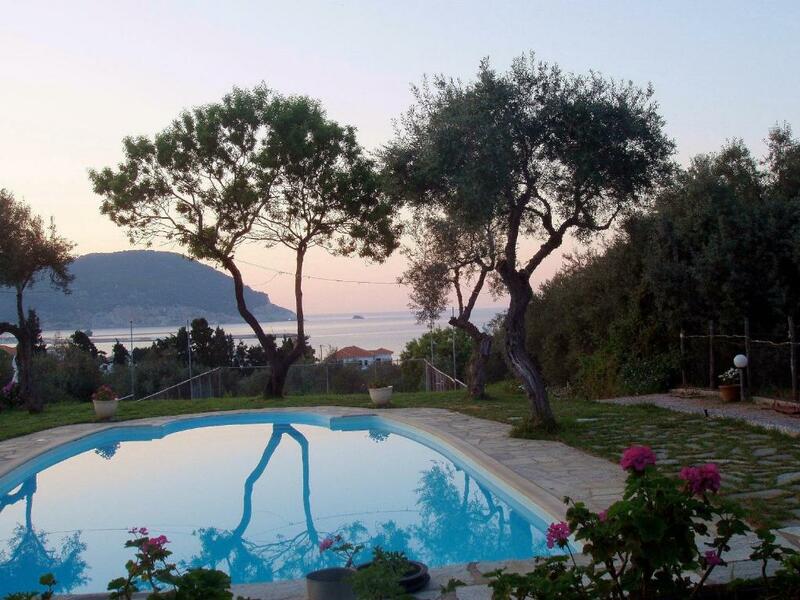 The pool isn't very close to the apartment but it's lovely and set in an olive grove with views over the bay. Sophie was very helpful and fetched us from the ferry.The kitchen was small and basic and our apartment was spacious with 2 bedrooms and a lovely outside area set under olive trees. We enjoyed it so much we extended our stay.